SORRY, ALL EXTRA DISCOUNTED OVERSTOCKS HAVE SOLD OUT OF THIS ITEM. BUT OUR INSTANT REBATE PRICE STILL APPLIES! A polished silver heart pendant shaped into a cascade of large clear crystals down one side and silver studs nestled inside antiqued twisted rope down the other side. 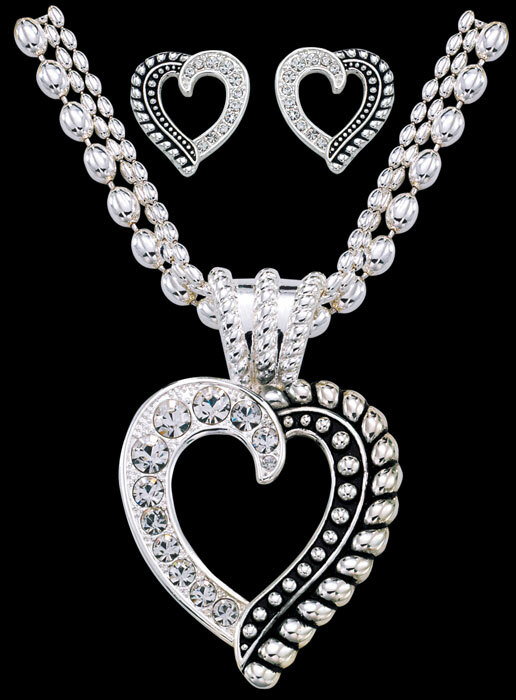 A choker length silver bead torsade necklace matched with two matching heart earrings. Heart Pendant = 1 7/8" x 2"
Earrings = 7/8" x 3/4"
Hypo-allergenic surgical stainless steel earring posts. Made by American craftspeople in Columbus, Montana, U.S.A.